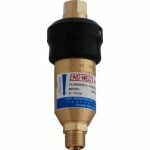 The Engweld GA D-99 flashback arrestor is designed to offer complete protection, for both operator and equipment, combined with high flow performance and ease of use. Designed and manufactured to fully comply with BS EN 730-1, the GA D-99 flashback arrestors provide complete protection for all oxygen and fuel gas equipment requirements. One of the requirements of BS EN 730-1 is that the safety features contained within the flashback arrestor must be clearly marked on the product label with the appropriate symbols. These symbols can be found on the GA D-99 label.